After a two-year-long search, East German native Eckart Preu has been named the eighth Music Director of the Long Beach Symphony Orchestra. He replaces Enrique Arturo Diemiecke, who resigned at the end of the 2013-2014 season. Preu, who turns 47 on Thursday, has been Music Director of the Spokane (WA) Symphony since 2004 and of the Stamford (CT) Symphony since 2005. He will relinquish the latter role when he assumes the LBSO Music Director position in 2017. LONG BEACH, CA, August 19, 2016 – Following a 2-year search that brought 9 guest conductors to the stage of the Long Beach Performing Arts Center, Long Beach Symphony proudly announces today that it has selected Eckart Preu (rhymes with “joy”) to take the helm under a 3-year contract beginning with its 2017-18 season. Maestro Preu says he decided to accept the position with Long Beach Symphony “because of its pure excellence – an excellence that extends not only to the amazing quality of its musicians, but also to the excellence in how its staff and volunteers run the organization. He looks forward to getting to know the wider Long Beach community, including its inspired arts leaders, musicians, and supporters and relishes the opportunities that a community as large and impressive as Long Beach can bring. When asked for comment on the appointment, Long Beach Mayor Robert Garcia expressed his approval saying, “The Symphony and the arts play a crucial role in our thriving community. The City of Long Beach wants to be among the first to welcome our talented new Maestro! Maestro Preu will serve as Long Beach Symphony’s Music Director Designate during the 2016-2017 season, returning to Long Beach to conduct the Symphony Concerts for Young People on February 1 and 2, 2017 for over 12,000 Long Beach Unified 4th and 5th graders. Within that same week, he will conduct Berlioz’s magnificent Symphonie fantastique and Saint-Saens’ Danse macabre as well as Dukas’ classic, The Sorcerer’s Apprentice at the February 4, 2017 Classical concert at the Long Beach Performing Arts Center, Terrace Theater. Tickets will be released on sale on September 10, 2016. Maestro Preu will continue to serve as Music Director of the Spokane Symphony (WA), but will step down from his current position with the Stamford Symphony (CT) next year. Commencing in the 2017-2018 season, he will take on his full time Music Director position, and will program and conduct all six Classical series concerts, all Youth Concerts and one POPS! concert annually. Maestro Preu’s philosophy on classical music complements the demographic make-up and cultural vibrancy of the Long Beach community. Paralleling the Symphony’s current efforts to reach out to diverse segments of the City with its Sounds and Spaces program, Maestro Preu believes that classical music can be accessible and enjoyable for everyone. Eckart Preu was born in Erfurt, a town that was, at that time, part of the German Democratic Republic (East Germany). He and his older brother grew up with a musically-inclined father who started them on music lessons early in life. At age 10, they were enrolled in the Dresdner Kreuzchor (Dresden Boys’ Choir), one of the world’s oldest and most famous boys’ choirs and boarding schools. Preu studied there for 8 years, eventually becoming a soloist, rehearsal pianist and assistant conductor. Subsequently, he earned a master’s degree in conducting from the Hochschule fuer Musik in Weimar and then went to Paris for two years to study at the Conservatoire National Superieur de Musique, where he also served as Music Director of the Orchestre International de Paris from 1993-95. Then in 1996, Preu won the National Conducting Competition of the German Academic Exchange Service, which afforded him the opportunity to come to the United States for graduate studies at the Hartt School of Music in Connecticut. Upon completion of his studies there, Preu became Assistant Conductor for the American Symphony Orchestra, a position he held from 1997-2004. During these years, he also held posts as principal conductor of the New Amsterdam (NY) Symphony Orchestra and associate conductor of the Richmond Symphony, among others. 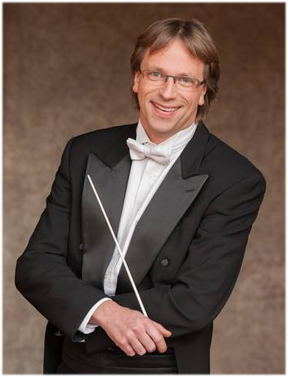 In 2004, Preu decided to make a fresh start by moving to the state of Washington to accept the position of music director with the Spokane Symphony Orchestra. To welcome him to the area, the Symphony put up billboards around town bearing Preu’s image. As the story goes, a young woman who drove by took one look at his fetching visage and instantly decided that was the man she was going to marry. The rest, as they say, is history. Eckart and that same woman, his wife, Neeley, currently reside in Spokane with their two daughters, ages 8 and 5. Though his rigorous schedule, community involvement and young family do not leave much time for R&R, when he does manage to carve out some time for himself, Preu seeks quiet. “I am around music all day, so at the end of the day, I relish quiet. It is sacred to me.” It is partly for this reason that he has recently taken up golf. He enjoys the peacefulness of the golf course and the opportunity to commune with nature. And, in seemingly diametric opposition to that, Preu also loves action movies! • The LBSO has also rounded out its conducting roster for the upcoming season. Mei-Ann Chen, who has appeared with the Pasadena Symphony and Pacific Symphony locally, will conduct a program of Glink, Rachmaninoff and Respighi on Nov. 19, while Paul Polivnick will lead an evening of Beethoven, Lebrun and Dvorak on March 8. Full-season INFO.